Are you a social justice warrior who likes to turn comedy bits into Twitter wars? Are you a comedian who likes to provoke Twitter wars by using the term “social justice warrior?” Did you love American Sniper before even seeing it? Did you hate American Sniper before even seeing it? Then Brigade wants you! 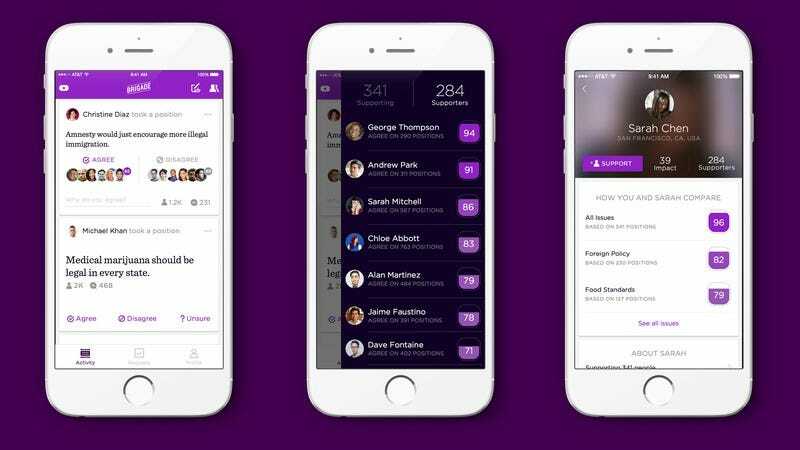 Napster mastermind Sean Parker (you know, the guy Justin Timberlake played in The Social Network) has launched Brigade, a social media network designed especially for armchair slacktivists who think that posting their political opinions on the internet will change something. Currently in beta mode, Brigade enables folks on both sides of the aisle who want to post one-sided, uninformed memes and argue about them with people they will never engage with socially, preferably in all caps. After signing up, users form a profile based on a series of ideological questions like (we assume) “How often do you use the term ‘thug?” and “Quein es mas macho: Barack Obama or George Bush?” Based on the answers, you can see which of your friends agree with your political beliefs and which are naive socialists/heartless fascists. MTV reports that whoever wrote the copy on Brigade’s website is delusional enough to think that Brigade is the “first app that lets you discover which of your friends support you, and on what issues.” In an interview with Politico, Parker adds, “When it comes to your civic identity or your political identity or your charitable identity, frankly you don’t want to express that side of yourself on Facebook,” implying that Parker has never been on Facebook. If you begin most sentences with “I’m the most politically incorrect person you’ll ever meet” before launching into a racist tirade, you can “become a founding member of Brigade” here. And please, save your anti-Zionist comments for the app.